Jiménez-García, A. M., Ruiz-Leyva, L., Vázquez-Ágredos, A., Torres, C., Papini, M. R., Cendán, C. M. and Morón, I. (2019). Consummatory Successive Negative Contrast in Rats. Bio-protocol 9(7): e3201. DOI: 10.21769/BioProtoc.3201. Using animal models in addiction and pain research is pivotal to unravel new pathways and mechanisms for the treatment of these disorders. Reward devaluation through a consummatory successive negative contrast (cSNC) task has shown the ability to reduce physical pain sensitivity (hypoalgesia) and increase oral ethanol consumption in rats. The procedure is based on exposing the experimental animals to a 32% sucrose solution during several sessions (preshift sessions) followed by a devaluation to 4% sucrose during the next few sessions (postshift sessions). The cSNC effect can be monitored by comparing the experimental group to an unshifted control that had access to 4% sucrose throughout the entire experiment (preshift and postshift sessions). The cSNC phenomenon is defined by lower consumption of sucrose in the downshifted group than in the unshifted group during postshfit sessions. There is experimental evidence that emotional states (e.g., anxiety or frustration) influence sensitivity to physical pain and correlate with the consumption of psychoactive substances like alcohol (Wiech and Tracey, 2008; Xie et al., 2012; Manzo et al., 2015). Reward devaluation is a viable strategy to induce a negative emotion such as anxiety (see Flaherty, 1996; Papini et al., 2015). Reward devaluation can be implemented in different procedures, including appetitive extinction, partial reinforcement, and successive negative contrast (SNC). All of them imply unexpected changes in reward magnitude or quality. In appetitive extinction, the reward is withheld altogether, while for partial reinforcement the reward is withheld on some random number of trials. SNC implies not the elimination, but a devaluation of the magnitude or quality of the reward. In the consummatory successive negative contrast (cSNC) task, one type of SNC procedure, animals receive free access for 5 min to a high-value sucrose solution (usually 32% sucrose) during several daily sessions, followed by several sessions of access to a low-value sucrose solution (usually 4% sucrose) (Jiménez-García et al., 2016). Performance of downshifted animals is compared to the consummatory behavior of animals that have always received access to 4% sucrose (unshifted controls). The cSNC effect involves a suppression of consummatory behavior after the 32%-4% sucrose downshift followed by a recovery to the level of unshifted controls. The initial suppression (typically observed during the first devaluation session) and the recovery that follows (normally starting during the second devaluation session) are dissociable stages of the cSNC effect (Flaherty, 1996). Several sources of evidence suggest that cSNC modulates and is also modulated by physical pain (Jiménez-García et al., 2016). Papini et al. (2015) suggested a connection between physical pain (tissue damage) and psychological pain (reward loss) that invites further comparisons between these two sets of phenomena. For example, opioid ligands known to modulate physical pain also modulate cSNC, either during the first downshift session ([D-Pen2,D-Pen5]enkephalin, a selective delta-receptor agonist; Wood et al., 2005), during the second downshift session (U50,488H, a selective kappa-receptor agonist; Wood et al., 2008), or during both sessions (morphine; Rowan and Flaherty, 1987). Two opioid-receptor antagonists enhance the cSNC effect either selectively during the first downshift session (naltrindole, a selective delta receptor antagonist) or during both the first and second downshift sessions (naloxone, a nonselective opioid receptor antagonist; Pellegrini et al., 2005). Similarly, lesions of brain areas involved in pain processing, such as the anterior cingulate cortex, also affect recovery from reward downshift from the second downshift session onward (Ortega et al., 2011). Likewise, ethanol consumption is increased by cSNC. Reward devaluation produces an anxious state (frustration) that can be mitigated by the anxiolytic effects of ethanol. Manzo et al. (2015) showed an increase in ethanol consumption after reward devaluation (post-shift sessions). Figure 2. Equipment. A. Timer and chronometer. B. Consumption chamber. C. Weighing scale. D. Personal protective equipment. See Figure 3 for the Timeline of daily experimental procedure. Figure 3. Timeline of daily experimental procedure. *High/low value sucrose depending on each experimental group. Individualize each animal in polycarbonate standard cages with free access to water and maintain under controlled standard conditions (12 h dark/light cycles starting at 08:00 h, 24 °C temperature, and 50%-60% humidity). Deprive animals of food to 82%-85% of their ad lib weights throughout the experiment. Once animals reach the required weight, feed daily with 9 g (±1.5 g) of rat chow to maintain body weight. All manipulations must be carried out at the same time every day and preferably by the same person. Efforts must be made to minimize suffering and reduce the number of animals used in the experiments. 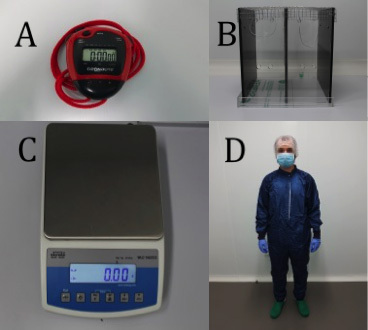 To maintain the animal’s body weight as assessed before the start of the experiment, it is important to weigh each specimen every day and provide supplementary food no less than 30 min after the end of each session. Moreover, sucrose solution must be prepared fresh daily to avoid contamination. cSNC training lasts 19 daily sessions: 16 preshift sessions followed by 3 postshift sessions. In the cSNC task, at least two experimental groups are required. During the preshift sessions, one of them has access to a large reward (e.g., 32% sucrose solution) and the other to a small reward (e.g., 4% sucrose solution). During postshift sessions, both groups are exposed to the small reward (4% sucrose solution). Before each session, animal racks must be moved into a different room where the experiment will be held, allowing the rats 15 min in their home cages to settle down, before placing them the consumption chambers. The contrast session lasts 5 min from the first contact with the sipper tube. 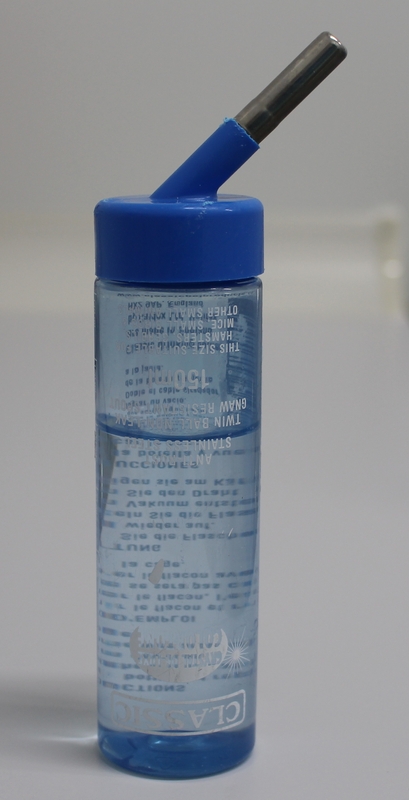 The position of the bottle is counterbalanced daily to minimize the effects of side preference. The animal is placed back in its home cage at the end of the session. Session duration for each box can be measured manually with digital clocks (Digital Onstart 100). Sucrose consumption is recorded for each animal weighing the bottles before and after the session, and then transforming the weight to milliliters (having accounted for the density of each solution) using the formula: Grams of solution consumed/density (grams per milliliter). All animals receive training every day in groups of 4, with the order of groups counterbalanced across days. At the end of every session, contrast chambers must be wiped with a wet paper towel and feces removed as needed. Animals must be fed with the proper amount of rat chow to maintain body weight no less than 30 min after the end of each session. In the cSNC situation, the dependent variable was the total amount of sucrose consumed in each session (in milliliters; Figure 4). The consumption chamber should be cleaned with sterile water to remove any animal odor. It’s necessary to cover the boxes’ floor with standard home cage sawdust. No access to food or water should be allowed. For the sucrose presentation, a graduated cylinder (in 0.01 ml units) with a metallic sipper tube can be used. cSNC training can be reduced to 15 daily sessions: 10 preshift sessions followed by 5 postshift sessions. This procedure is the typical protocol in cSNC experiments and, for that reason, it is advantageous too. 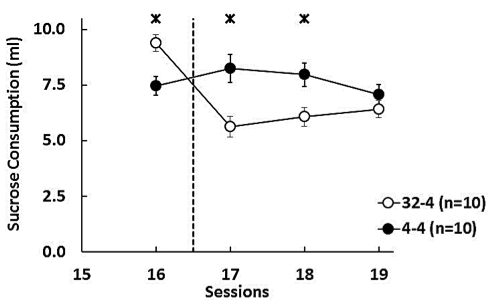 Some experiments have reported a cSNC effect with minimal preshift experience (one session: Flaherty et al., 1983), but less than 10 preshift sessions is infrequently used. The final protocol chosen will depend on other requirements associated with the problem of interest. A recording system (i.e., camera) could be used optionally. Thus, place the recording system on the side of the chamber. Ensure that the oral region of the animal is clearly visible. A magnetic stirrer may be useful to properly dissolve sucrose. This paper was partially supported by the Spanish Ministry of Economy and Competitiveness (grant PSI-2013-44945-P), the Junta de Andalucía (grant CTS109), FEDER funds and the Master’s program in Basic and Applied Neuroscience and Pain, University of Granada, Spain. MRP’s participation was supported by a Fulbright US Scholar Award. Animals were maintained according to the EU Directive 2010/63/EU for animal experiments. We thank the CTS430 group, especially M. Á. Zafra, for their help. This protocol and figures are adapted from our previous work (Jiménez-García et al., 2016). The experimental protocols were approved by the University of Granada Research Ethics Committee. Reference: SSA/SIS/MD/jv (valid from 31/03/2016 to 31/03/2021). Flaherty, C. F. (1996). Incentive relativity. Cambridge University Press, UK: Cambridge. Flaherty, C. F., Becker, H. C., and Checke, S. (1983). Repeated successive contrast in consummatory behavior with repeated shifts in sucrose concentration. Anim Learn Behav 11: 407-414. Jiménez-García, A. M., Ruíz-Leyva, L., Cendán, C. M., Torres, C., Papini, M. R., and Moron, I. (2016). Hypoalgesia induced by reward devaluation in rats. PLoS One 11(10): e0164331. Manzo, L., Donaire, R., Sabariego, M., Papini, M. R., and Torres, C. (2015). Anti-anxiety self-medication in rats: oral consumption of chlordiazepoxide and ethanol after reward devaluation. Behav Brain Res 278: 90-97. Ortega, L. A., Uhelski, M., Fuchs, P. N. and Papini, M. R. (2011). Impairment of recovery from incentive downshift after lesions of the anterior cingulate cortex: emotional or cognitive deficits? Behav Neurosci 125: 988-995. Papini, M. R., Fuchs, P. N. and Torres, C. (2015). Behavioral neuroscience of psychological pain. Neurosci Biobehav Rev 48: 53-69. Pellegrini, S., Wood, M., Daniel, A. M. and Papini, M. R. (2005). Opioid receptors modulate recovery from consummatory successive negative contrast. Behav Brain Res 164(2): 239-249. Rowan, G. A. and Flaherty, C. F. (1987). The effects of morphine in the consummatory contrast paradigm. Psychopharmacology (Berl) 93: 51-58. Wiech, K. and Tracey, I. (2009). The influence of negative emotions on pain: behavioral effects and neural mechanisms. Neuroimage 47: 987-994. Wood, M., Daniel, A. M. and Papini, M. R. (2005). Selective effects of the δ-opioid receptor agonist DPDPE on consummatory successive negative contrast. Behav Neurosci 119: 446-454. Wood, M. D., Norris, J. N., Daniel, A. M. and Papini, M. R. (2008). Trial-selective effects of U50,488H, a κ-opioid receptor agonist, on consummatory successive negative contrast. Behav Brain Res 193: 28-36. Xie, J., Bi, Q., Li, W., Shang, W., Yan, M., Yang, Y., Miao, D. and Zhang, H. (2012). Positive and negative relationship between anxiety and depression of patients in pain: a bifactor model analysis. PLoS One 7: e47577. How to cite: Jiménez-García, A. M., Ruiz-Leyva, L., Vázquez-Ágredos, A., Torres, C., Papini, M. R., Cendán, C. M. and Morón, I. (2019). Consummatory Successive Negative Contrast in Rats. Bio-protocol 9(7): e3201. DOI: 10.21769/BioProtoc.3201.